Brussels, 18 September 2014: The 2014 EACA Euro Effies winners were announced in Brussels’ Cercle de Lorraine business club last night. Winners from 8 countries across Europe were awarded a Euro Effie for their effective and creative work. Germany won 13 out of 26 awards, followed by the United Kingdom with 7 and The Netherlands with 2. Agencies from France, Italy, Latvia Slovenia and Sweden walked away with one Euro Effie Award each. 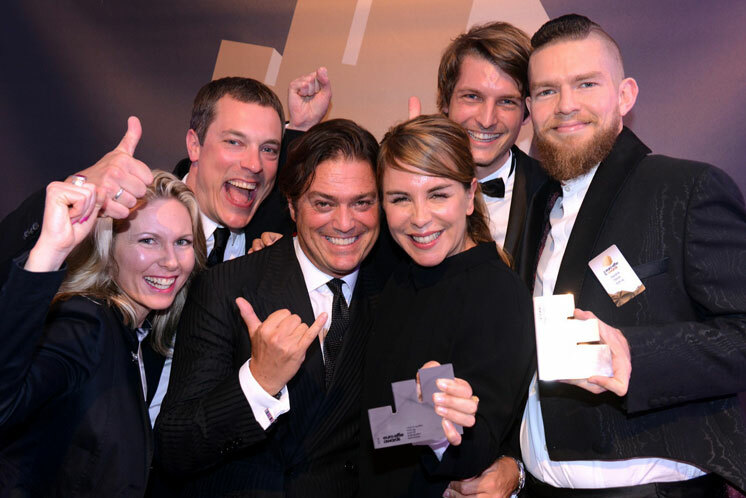 thjnk ag has brought back victory for independent agencies by winning the Euro Effies Agency of the Year Award. With 5 entries from Audi, thjnk ag achieved a high first round average score and further success with a Gold award (Best demonstration of integrated effectiveness) and 3 Silvers (Best demonstration of integrated effectiveness and automotive (2)). The agency was also rewarded with €100,000-worth of free advertising spots from Euro Effies partner Euronews. The prestigious Grand Prix for outstanding work was presented to 180 Amsterdam and PlayStation for their campaign “This is for the Players. This is PS4.” The campaign successfully launched PS4 console against stiff competition from Xbox. The campaign’s objectives were to achieve market leadership and, in particular, to close the gap between market leader Xbox and PlayStation in the UK. Gold awards were awarded to thjnk ag for their “Harder, Better, Faster, Stronger” campaign created for Audi’s A3 Sportback, to Mindshare Germany and Dokyo Hamburg for their Unilever campaign “AXE Apollo – Send our guys into orbit”, to Heimat Werbeagentur for their campaign “The Hornbach Hammer” created for Hornbach Baumarkt, 180 Amsterdam and OMD for their SONY campaign “This is for the Players. This is PS4”, Ogilvy & Mather London for Expedia’s “Travel Yourself Interesting”, DDB Latvia and SSE Riga Alumni Association for “Let’s beat Stanford” and BETC for Evian’s “Evian Baby & me”. Silver awards went to thjnk ag and Audi AG for “Land of Quattro” (Automotive and Best Demonstration of Integrated Effectiveness categories) and for “Harder, Better, Faster, Stronger”. Silvers also went to Innocean Worldwide Europe for their Kia Motors Europe campaign “Kia Carens, to Serviceplan and BMW Group for “One World. One RG 1200S.”, to Ogilvy Düsseldorf for their Philips campaign “Designed to Play”, Grey London and Procter & Gamble for “No Fairy Tale”, Lowe & Partners, Lowe Open, DLKW Lowe and Unilever “For whatever life throws”, House of Radon, Seventy Agency and At Night Management received for their Universal Music campaign “Avicii X You”, Grey London and Vodafone RED for “Sealed with a kiss”, Publicis Slovenia, Atlantic Media, Publicis Macedonia, Alert and M.I.T.A AND Atlantic Grupa for their campaign “Argeta - approved by mums” and ZenithOptimedia and CHI & Partners for their Lexus Europe campaign “The new Lexus IS. An amazing launch”. All Euro Effie winners will be recognized in the 2015 Effie Effectiveness Index. This year’s international Euro Effie jury of senior agency and advertiser representatives was chaired by Geoff Seeley, Global Communications Planning Director at Unilever. The Euro Effies Awards are produced in partnership with Euronews and supported by the European Publishers’ Council, FEPE, TIME & Fortune magazines, Procter & Gamble, AdForum, WARC, Viva Xpress Logistics, Nielsen, Bacardi-Martini and creativebrief. Introduced in 1996 to reward advertising that builds brands across borders, the Euro Effies® were the first pan-European advertising awards to be judged on the basis of effectiveness. Effie® and EURO Effie® are registered trademarks of Effie Worldwide, Inc. and are under license to EACA. All rights reserved. The European Association of Communications Agencies (EACA) is a Brussels-based organisation which represents full-service advertising and media agencies and agency associations in Europe. EACA aims to promote honest, effective advertising, high professional standards, and awareness of the contribution of advertising in a free market economy and to encourage close co-operation between agencies, advertisers and media in European advertising bodies. Championing the practice and practitioners of marketing effectiveness, Effie Worldwide spotlights marketing ideas that work and encourages thoughtful dialogue around the drivers of marketing effectiveness. The Effie network works with some of the top research and media organizations worldwide to bring its audience relevant insights into effective marketing strategy. The Effie Awards are known by advertisers and agencies globally as the pre‐eminent award in the industry, and recognize any and all forms of marketing communication that contribute to a brand's success. Since 1968, winning an Effie has become a global symbol of achievement. Today, Effie celebrates effectiveness worldwide with over 40 global, regional and national programs across Asia-Pacific, Europe, Latin America, Middle East/North Africa and North America. Effie initiatives include the Effie Effectiveness Index, ranking the most effective companies and brands globally and the Effie Case Database. For more details, visit www.effie.org. Follow @effieawards on Twitter for updates on Effie information, programs and news.